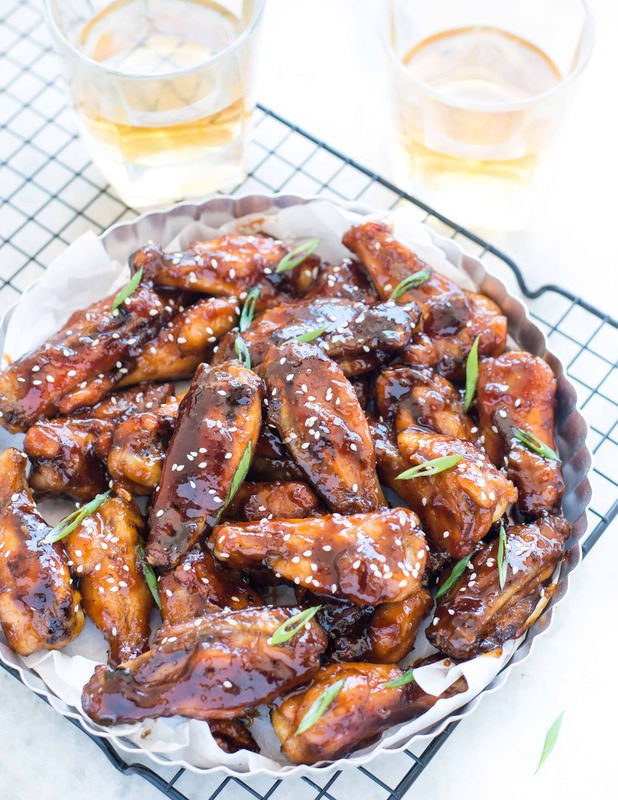 These Healthy Sweet and Sour Chicken wings are Juicy, delicious and perfect party appetizer. No Refined sugar and made in a skillet in 30 minutes. Let’s take a moment and look at those chicken wings with gorgeous sweet and sour sauce. 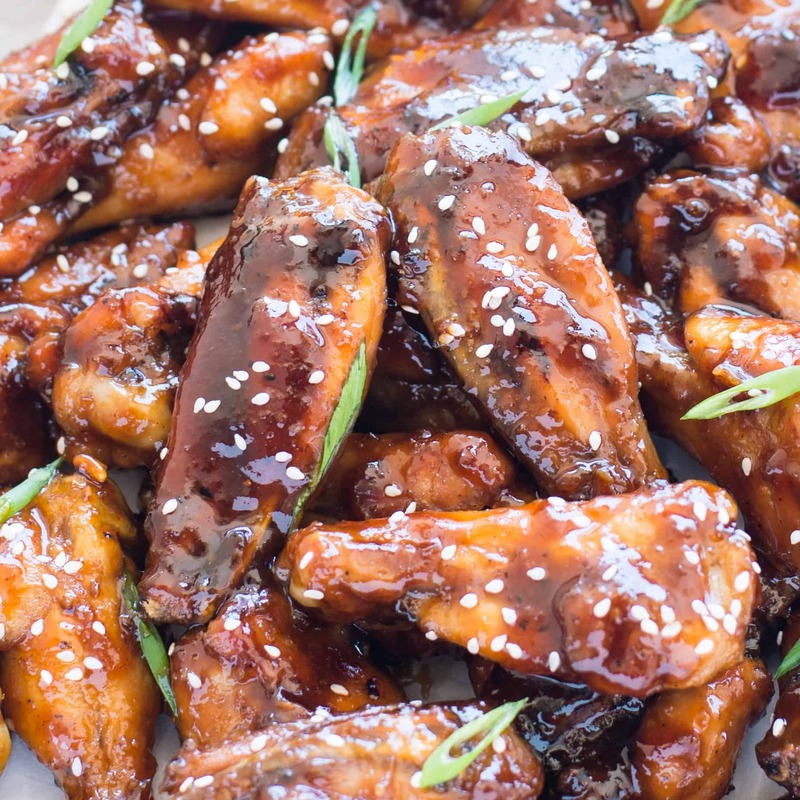 These Sweet and Sour chicken wings are the best ever Asian appetizer I have ever made. Pat on my back!! If you are hosting a weekend party, then don’t forget to include these in your menu planning. All it takes is one pan and 30 minutes to make. The sauce is perfectly balanced. It has the right amount of sweetness and sourness. While there are a lot of recipes that use white sugar/ Brown sugar, the sweetness comes from honey in case of these wings. There is no difference in taste when you sub sugar with honey because I have tried both the version. Another good thing about these Sweet and Sour chicken wings is, these are neither baked nor fried. I have put just a couple of teaspoon of oil and fried these wings in a cast iron skillet. So you really don’t have to deep fry or bakes the wings to get the extra crunch. I am going to share the secret for perfectly crispy wings shortly. Make sure the wings are not wet and water dripping from it. Place the wings on a kitchen towel and press gently to make sure there is no extra liquid. While tossing the wings in baking powder and cornstarch mixture, do it in batches. Don’t add the mixture all at once. This ensures the wings are evenly coated. Keep the cooking pan well greased and hot. Once the wings are cooked/fried it starts to release water. So place the cooked wings on a wired rack and place a container below. So the liquid released from the wings won’t make them soggy, while you make the sauce. If you are making this for a big crowd, you can make cook the wings and make the sauce beforehand. And Just before serving, heat the sauce and toss in the crispy wings. 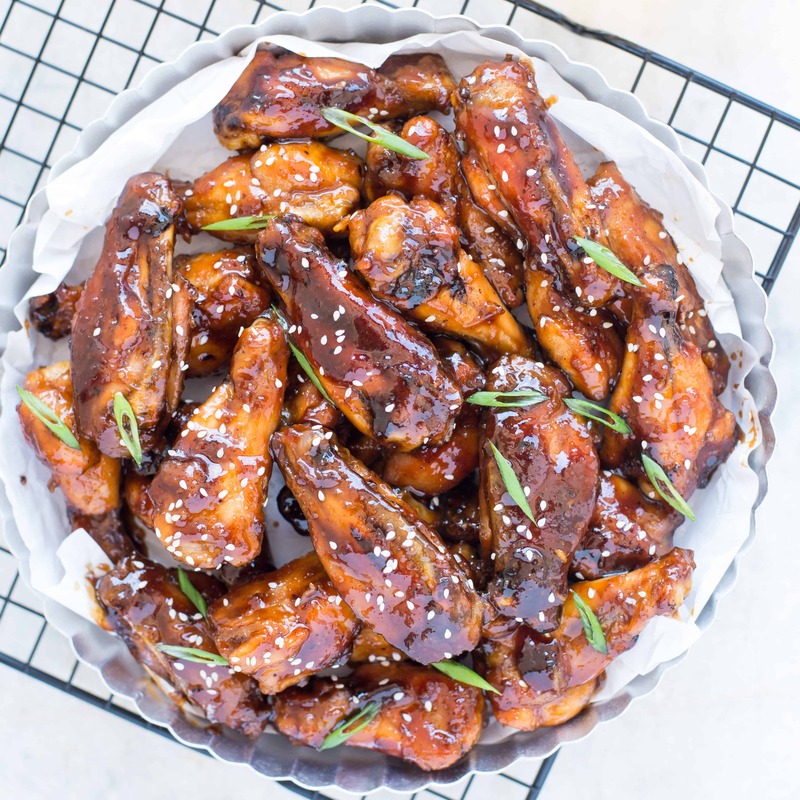 These Healthy Sweet and Sour Chicken wings are Juicy, delicious and perfect party appetizer. No Refined sugar-free and made in a skillet in 30 minutes. In a mixing bowl add all the ingridents mentioned under sauce. Mix well and keep aside. Using a kitchen towel, pat dry chicken wings. Put them in a bog mix bowl. Season lightly with salt and pepper. Add cornstarch mixture in 2-3 batches to the chicken wings. Toss well before adding another batch of cornstarch mixture. Spread the chicken wings in a single layer. Cook undisturbed on medium-high heat for 5 minutes. 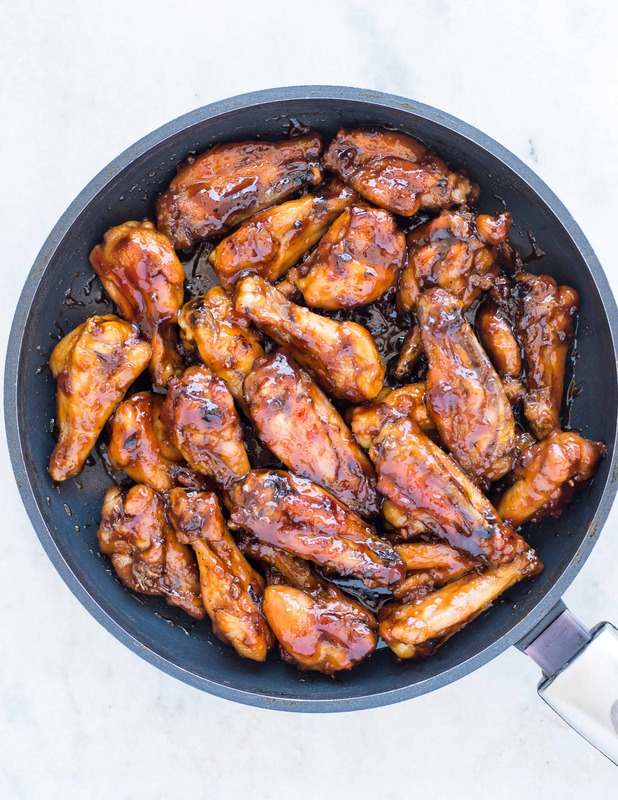 Turn the wings and cook further 4-5 minutes. The wings should feel crispy and look light golden brown in color. Remove the wings and put on a wired rack while you make the sauce. Add above sauce mixture to the same pan. Cook sauce until it is half in quantity and looks little thick. Add chicken wings and toss well until wings are well coated with the sauce. During this sauce will thicken even further, So maintain low heat. You can substitute apple cider vinegar with regular vinegar. But Apple cider vinegar gives a nice fruity punch to the sauce. Adjust the amount of honey and vinegar as per your preference. You can always taste the sauce and adjust it. For little heat, you can add 1/2 teaspoon chili flakes.